I am quite confident there is no one in the world who have been chasing with more storm chasing tour companies than I. Up to this date I have chased with 8 different tour companies: Cloud 9, PDS Storm Tours (no longer active), Tempest Tours, Extreme Chase Tours, Tornadic Expeditions, Tornado Alley Chasing, Silver Lining Tours, and Weather Adventures. I have also been a very active and observant tour guest and, at least after my first two tours, also with a decent knowledge about chasing storms. This blog post concludes my general feedback on what I believe every storm chasing tour company should consider. Through my experience with chasing with almost all major storm chasing tour companies I have concluded some feedback that I believe would benefit any owner of a storm chasing tour company that is interested in improving his or her business. My purpose with this blog post is to try to help improving the storm chasing business as a whole, both for the business owners and future tour guests. My feedback is based upon what different tour companies have done well on the tours I have been on, as well as things that can be improved in some, or all, tours. This feedback is mainly based on my own experiences as a tour guest but is also based on what I have heard from other tour guests. Some tour companies send out a welcome letter with extensive information about what to expect from the tour, suggestions on what to pack, contact information, hotel address, important time and dates etc. This is, off course, a great idea that you should implement in your business unless you are already doing so. From a tour guest perspective it is great to have one document to print out where you have access to all the information you will need for your tour – especially if something goes wrong. Many tour companies have information like this on their website but getting it over email prior to your trip makes you feel extra welcome and removes a lot of questions. If you buy a tour for $2.500 and don’t hear anything until the week before, you may start to feel very uncomfortable. All of the tours I have been on have had a meet and greet-dinner before the tour, which is a good idea. This is a perfect opportunity to talk about the practicalities of chasing storms, perhaps have a quick introduction to forecasting as well as discussing how the weather is likely to be during the tour. Take this opportunity to set the standard of what they can expect from the tour and what you expect from the tour guests. Even if you focus on sharing a full forecast with your tour guests every day or just have a short briefing it is important that you at least comment the forecast of the day – even during down days. At least, make sure you communicate possible chase targets and scenarios for the day. This is not only important to make the experience more fun and involving for the guests but also to show that you are on top of things. As some tour guests check the SPC forecast in the morning it is probably a good idea to mention how your forecast compares to theirs, especially if you decide to go to another target than their “bullseye” (for example if the SPC risk is mainly about hail or out of reach from where you are positioned). We all know that the SPC bullseye is not always the best (or reachable) target for storm chasers but it should at least be commented. I believe the chase vehicle is the second most important part of a storm chasing tour (after the tour guide) for many different reasons. You spend between 5-10 hours a day in the van and it is from the van you will spend the majority of the time during the active part of the chase. My number one recommendation for each tour owner is to spend at least 2-3 chase days as a tour guest in the back seats (all of them). If you run several vans on a tour, try different vans as well. Many tour guides and tour owners spend all of their time in the front seat (with all information at hand) without really knowing how the chase experience is from the back seat(s). If your tour company are using a 15 seat van you are likely to have flat seats with flat back rests (i.e. no curved seats) and no neck support. While driving on curvy roads this makes your tour guests having to lean into each and every turn. This quickly makes the back muscles tired and sore. The lack of neck support also makes it very difficult, if not impossible, to fall asleep while chasing which can be quite a nuisance. It is also a safety issue in terms of whiplash injuries. One thing that could make the experience in the seat more convenience is to add a pocket in front of each seat where the tour guest can put his/her iPad, book, sunglasses, food etc. It is easy to lose your stuff while getting in and out of the van with stuff lying everywhere around. Many tour companies have access to USB-contacts or proper 120V sockets for the tour guests. This is very appreciated as it allows tour guests to charge cameras, laptops, iPads etc while chasing. Having a wifi-connection in the van is not only convenient for the tour guests but makes it much more likely that they will talk about your tour on social media, while being on the tour. With the amount of miles travelled each year by chase tour vans, I am quite sure that at some point in the future there will be a car accident involving a chase tour vehicle. Make sure you prepare yourself with what would happen inside your tour vehicle if it would crash. Do you force all your tour guests to wear a safety belt? This is not only important for the tour guests themselves but unbelted tour guest will fly forward and kill or injure the person in front of him/her. Demand tour guests have their seat belts on, if nothing else but for the safety of the others, including yourself. If the luggage department is not separated from the seats and piled up high, luggage is likely to fly forward towards the tour guests heads in case of a crash. If possible, invest in a safety net to shield the guests from the luggage. There are a lot of things that will fly around the van in case of a collision (cameras etc). This is difficult to control but could at least be limited to a minimum. As for now there are no tour companies where the tour guide is also the driver, which is great. If the driver also needs to keep track of the radar, check the value of echo tops and VIL as well as perhaps shooting video of a tornado, he is not paying enough attention to the road. When people ask me if I am ever afraid while chasing I usually respond: “Never because of the tornadoes, but sometimes because of the driving”. This is the number one reason for it. Fortunately, all tour companies I have talked with have a dedicated driver nowadays (except perhaps one day tours). Do not block the view with cameras – Most of the action while chasing will be seen throughout the left side windows and the front wind shield. Do not keep to much stuff here that will block the view for the tour guests. One camera should be enough. Choose a chase vehicle with good visibility – Next time you pick a tour van go sit in the back and see how much you can see through the windows, especially on the right hand side and in the back. Some cars have a very low visibility angle making it difficult to see things that are happening above. Clean the van between tours – Do take the time to clean out old food items, vacuum dirt etc from previous tours. With too much stuff on the vehicle floor it is easy to lose track of things in the van and it gives a much better impression. Most tour guests are highly involved in the chase and will have an interest in the details of what is going on during the chase, for example by looking at radar images etc. This is especially true for returning/experienced tour guests. Other tour guests may have no clue and are just happy to be brought to any storm with no concern about why or what to expect. No matter what, all are likely to get a more positive experience from regular updates and information while chasing. Update your tour guests regularly on changes that happen during the chase – e.g. “This storm is becoming outflow dominant so we are moving south to another storm that is looking better”, “Our storm just became tornado warned!”, “The storms are congealing into an MCS which means the tornado potential is now very low, for that reason we will discontinue the chase today”, “The storm we have been chasing for a while is moving at 45 mph which makes it difficult to catch up with. It seems like we will catch up within 30 minutes”, “There is a TVS mark on our storm meaning our storm shows rotation. This is a good sign!”. If you haven’t updated your guests for about 30 minutes during the active part of a chase, they probably have no idea of what is going on or what to expect. Make sure EVERYONE is updated, not just the passengers in the seat behind you – Are you sure the tour guests in the seat furthest in the back can hear you? If you run several vans in your tour, do you know if the tour guests in the other vans are informed on what is going on? If not, maybe you need to install some sort of PA system to make sure the information is heard by everyone. Consider using a screen for your tour guests – several tour companies have a specific screen in the back seat for the tour guests to see what is on the tour guide’s screen. Even though not everyone knows how to interpret a radar image this is always interesting (as long as it doesn’t block the view). If not, consider using technological applications to split/share your computer screen by wifi with the tour guest’s phones and tablets. The main responsibility of the tour guide is to find the best storm of the day and make sure the tour guests are safely positioned to see it in good time. I have not been on a single tour where the tour guide has failed in this task. The tour guide is, however, also the leader of the tour and as such needs to control the “herd” of tour guests. This becomes more important the more guests you have. As stated before, the tour guide should make sure he communicates what is going on during the chase and perhaps also why you are making certain decisions, especially if the decision is to abort and go home. Inexperienced tour guests may not understand why you would leave a storm that is “still there”, even if you can see it is dissipating. The tour guide also has a responsibility of keeping a certain discipline of the tour guests, mainly for their own safety but also for other tour guests’ convenience. If a tour guest is affecting the tour in a negative manner (by being rude or always being late, either to morning meetings or back to the van while chasing) it is up to the tour guide to make sure the tour guest is informed about it. If one tour guest gets to the van 15 minute late and you miss a tornado by 15 minutes you will have a storm inside the van instead! This, off course, means you should always make sure you are on time yourself as well. There are certain issues in which you may have to chose between serving one tour guest and leaving the rest to miss a great chase day. Do you have a plan or policy about it? Do you have a plan of what to do if/when a tour guest gets sick during the tour? Will you sacrifice an excellent chase day for the other tour guests because you need to double back and get a sick tour guest at the hotel? Whichever plan you have, have you made it clear to your tour guests what will happen in that case? If the tour guests know you apply a “Leave no man behind” plan they are less likely to be negative about missing a great chase day, if they are prepared for it. Later in the season there are sometimes great chase opportunities in Canada. Although Canada may not be the primary choice of chase targets it is sometimes the only great target. Do you have a plan about chasing in Canada and has it been communicated to your guests? Consider there is a potential great tornado outbreak just north of the border and you cannot chase because one tour guest (out of perhaps 15) did not bring his passport because your tour company didn’t enforce it. This is best handled in the planning phase by either demand your tour guests to bring a passport (for certain tours later in the season) and make sure they don’t have a background causing problems crossing the border (such as a DUI). Check this, at least, in the beginning of a tour so you can inform your passengers that you will not chase in Canada whatsoever if that is the case. Imagine a scenario where you have no set policy about chasing in Canada and have not enforced your tour guests to bring a pass port and one tour guest makes it impossible. You chose to chase in North Dakota only to see reports are coming in over social media about amazing tornadoes in Canada. This will be very frustrating to the tour guests and put a lot of pressure on the one tour guest that was the cause. Make sure you have this planned, and communicated, in order to avoid a situation like this. Apologize to your tour guests about the missed opportunity. Explain what happened and why you chose the target you did (and perhaps why the other target performed much better). Sometimes a “bad” target simply overdelivers! Refrain from lingering on the missed tornado and do not allow your own mood to be affected by it publicly to your tour guests. If you get depressed about missing the tornado make sure your mood is not affecting your tour guests. Do not be the driving force in showing photos from the other tornado or to talk about it. If necessary, let the tour guests know you missed a great tornado and leave it at that. We all know you cannot expect a tornado or a well structured supercell on every given day. Some days will be bust days and some will have very meager storms. It is important to understand that many of your tour guests appreciate things you, as an experienced chaser, might neglect as boring. A shelf cloud on an MCS can be quite impressive, photographing lightning is often appreciated, you can go and find the strongest winds of the storm and invite the tour guests to go out and feel it, drive into the core and let your tour guests experience hail and if the hail is (too) large – head for the core just after it has passed and look for large hail stones. 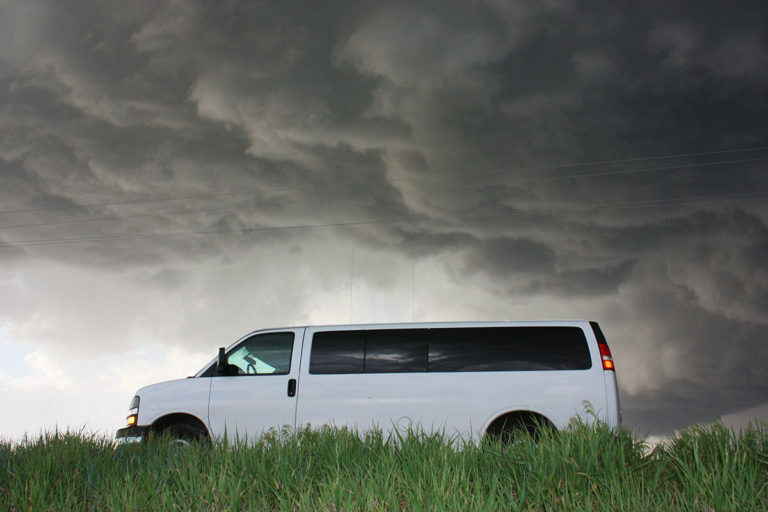 Many tour guests go on a storm chasing tour to experience extreme weather and this does not only mean tornadoes. For example, finding large hail is often a highly underestimated feature of a tour, from a tour company perspective. I understand tour companies want to avoid getting the van smashed by hail and perhaps lose a chase day because of it, but finding or experiencing large hail can be very exciting for tour guests. If tornadoes or storm structure are not a viable option – go for hail (in a safe way) if possible! If you really want to improve your storm chasing business make sure you constantly improve. The only way of doing so is to ask your tour guests what they thought about your tour. The best way of doing so is by letting your tour guests answer an anonymized feedback form after the tour. Ask detailed questions about main parts of the tour (vehicle, tour guide, communication etc) and make sure you implement the suggestions if possible. Make sure you get the feedback from all your tour guests as well, not only the ones that are satisfied. Try to find details of your tour that can be improved and make sure you address those issues for next season. I hope this blog post has offered some new ideas on how to improve your storm chasing tours and the tour experience from your tour guests. Please, feel free to leave comments about the post below. If you are a tour guest reading this blog post and have suggestions on other type of feedback tour companies should address, make sure to write a comment about it. Lastly, I am not pinpointing any specific tour company with this feedback even if a certain issue has occured while chasing with that particular company. Often, the same issues have appeared on several different tour companies. Very thorough post with some great feedback and observations. The only thing I might add is about what to do if there are no storms on a particular day. I’m sure many companies have plans for this, but I’d be interested in discussion on what to do, for example: Visiting landmarks, exploring local towns/cities, touring a nearby National Weather Service office, etc. As well as asking guests what they want to do on down days and making sure they understand why the tour is not chasing that day. Thanks. All tour companies I have been chasing with have had good plans for down days so I don’t see that as a problem. Down days are so common that many have a down day-plan for each region of the country. It would however be interesting to crowdsource a Google Map filled with hidden gems on what to do on down days. I will have a look into that, I don’t know that many myself to get it started but I will figure something out.